It was a day for happiness. It was a day for smiles. It was a day for a few tears of joy. But most of all it was a day for celebration. 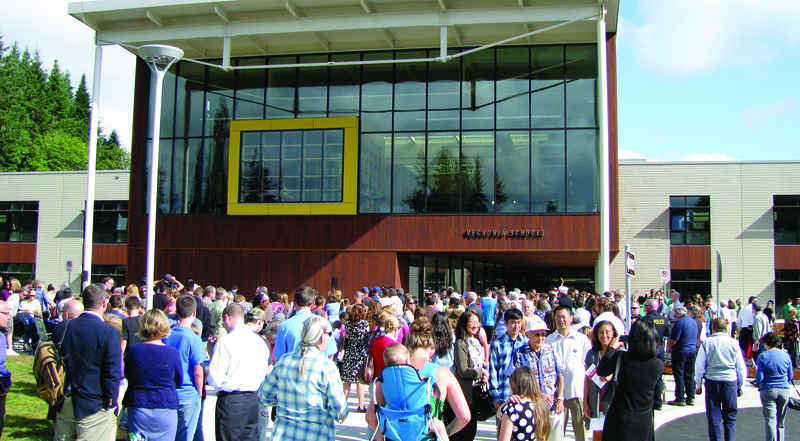 On August 21, 2012 the new Vernonia School was officially dedicated and opened. The events included speeches and tours of the new facility and also took time to thank all those who have had a hand in making this dream a reality. The day was filled with visiting dignitaries from government, business and philanthropy, including several US and Oregon Senators and Representatives and a former Oregon Governor. The day of celebration began at 9:00 AM with a short presentation inside the building. This was followed by the official Grand Opening Celebration at 10:00 AM in front of the new building with speeches by former Governor Ted Kulongoski, US Senators Ron Wyden and Jeff Merkley, US Representative Suzanne Bonamici, County Commissioner Tony Hyde and more. The biggest round of applause was reserved for State Senator Betsy Johnson, who has championed this project from the very beginning. The opening of the new school facility was a tribute to the many sectors that worked together to accomplish this goal, including the creation of an Oregon Solutions team by then Governor Kulongoski. The infusion of local, state and federal funding played played a significant role. Fundraising efforts, both big and small kept the campaign to replace Vernonia’s schools moving along, including donations from philanthropic organizations, private business and efforts by local students and citizens. Today V is for Vernonia. Today V is for vitality. Today V is for a valediction to churning flood waters claiming your schools, your homes and your businesses. Today V is for victory and for Vernonia. The facility is beautiful both inside and out. The wood siding, local materials and the upright cedar logs that tower over the main lobby and the wood benches both inside and out are a testament to the history of the community. The computer labs, natural lighting and energy efficiency and sustainability features speak to the modern design that has been incorporated into the construction. The new natural resources curriculum that will use the building as a working laboratory is a look towards the future. The facility will house grades K-12 in an innovative approach to cost savings and a new educational model. It is designed with the capacity to expand and hold up to 1000 students. The school building was designed to achieve LEED certification and to be a model which incorporates human and environmental health, sustainable site development, water savings, energy efficiency, materials selection and indoor environmental quality into its design and uses. The facility includes natural lighting and ventilation and is orientated on the site to maximize use of solar energy and day lighting. A biomass boiler will provide heating and cooling through a radiant in-floor system. The site includes bio swales to treat storm water; a community garden, a greenhouse and a nursery. Off site is a wetland education center. Some people thought the day would never arrive. But arrive it did, and there were smiles all around. Especially from the children and students who now have lockers and hallways and a new school they can be proud of. School Superintendent Dr. Ken Cox made sure the teachers and students were the first to enter the new building following the dedication ceremony, because first and foremost, this building will be for them.